Best Food in Rochester & Syracuse! 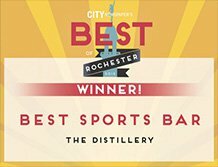 Help Celebrate The Distillery's 2nd Anniversary in Syracuse! The Distillery is YOUR Place to Watch Football! Choose Any 6 Sauces (Save $5)!